into the studio with each class. 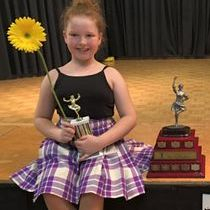 Tara started dancing with the Judy Dewar School of Dance when she was 6 years old and has continued to dance for 29+ years. She was a member of the Lochaline performance team from ages 9 to 19. She has been teaching for over 15 years and continues to love it as much as her students do. Tara is a Certified Associate (teacher) through the British Association of Teachers of Dancing (BATD) who is also the examining body through which the children in the studio will do their exams. She has completed all levels of exams up to and including her Teachers exam. In her dancer years, Tara competed and performed across Scotland, England, France, California, Florida, Pennsylvania, and Michigan. She also performed in three Disney locations: Disneyland (California), Disney World (Florida) and Euro Disney (France). As a studio, Tara's students have competed and performed throughout the Niagara Region and Southern Ontario during her 10 years history, and she continues to add new opportunities every year.